We’re thrilled to announce The Innovation and Design Building has received a 2018 Merit Award in Design from The Boston Society of Landscape Architects. 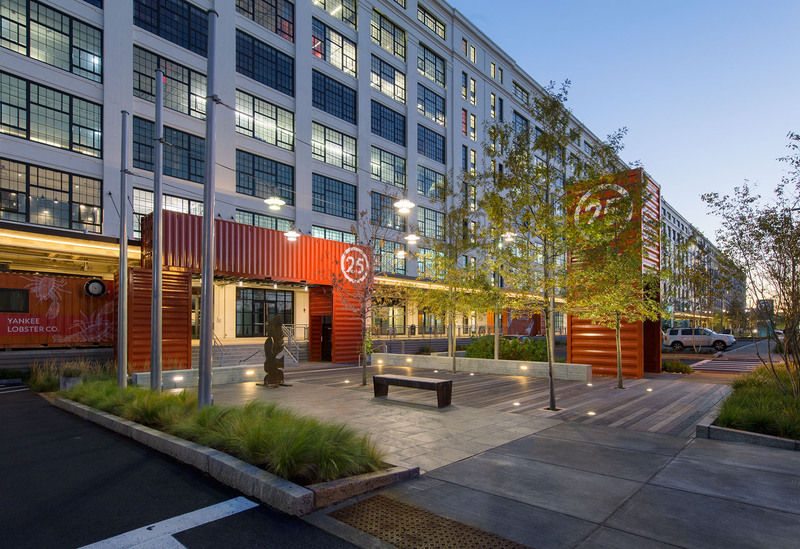 The Innovation and Design Building project repositions the existing Boston Design Center and proximate underutilized warehouse space into a clearly defined and vibrant urban workspace community in the rising Seaport District of Boston. The CRJA-IBI Group design team, led by Chris Jones, Steve Woods and Johnathan Law, joined common site vernacular with thoughtful reorganization of vehicular and pedestrian movement to achieve the goal of merging a unique industrial landscape with hospitable and vibrant gathering spaces. 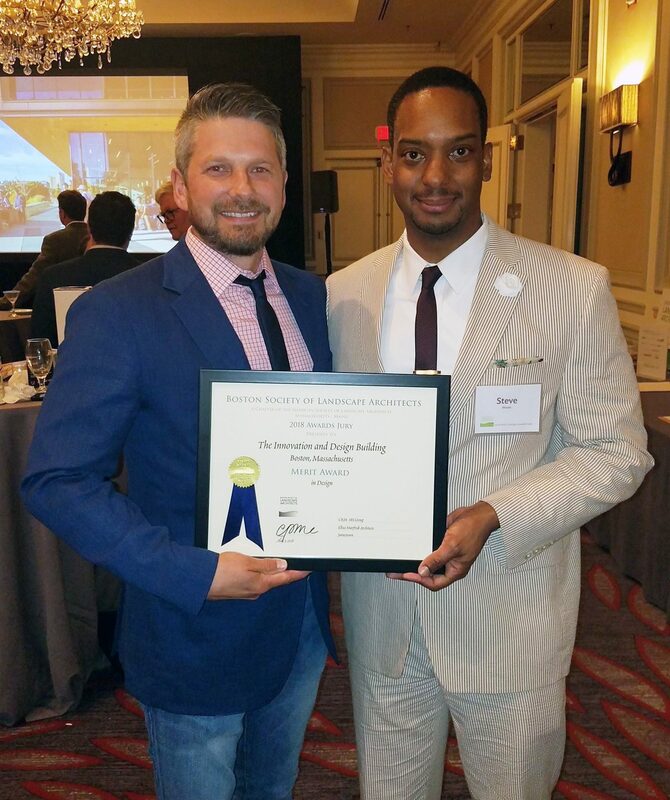 Senior Associates Johnathan Law and Steve Woods accepted the award at last night’s Gala held in Downtown Boston. 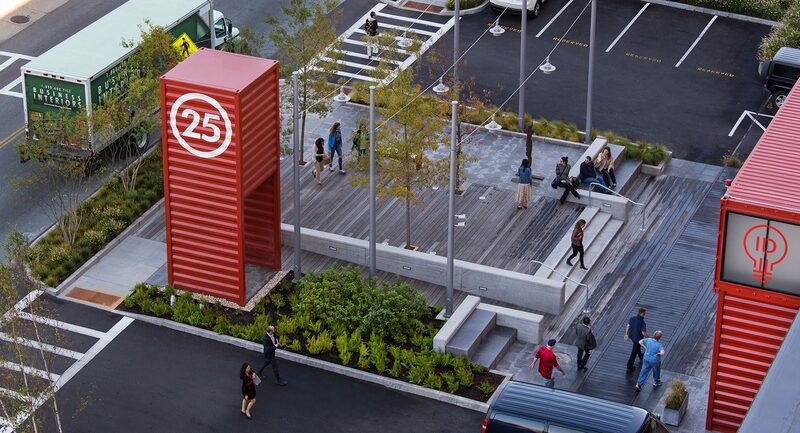 The design team’s inspiration, rooted in character and materials common to this industrial and shipping area, yielded the use of shipping crates in selected traditional colors to animate the dreary north facing side of the building. 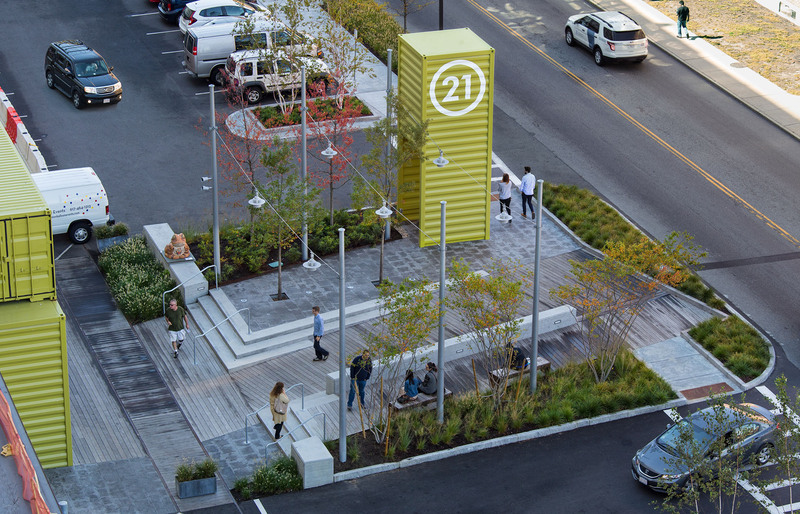 Our design punctuates the building entrances with street side “parklettes”, providing clear and direct entrance as well as exterior opportunities for seating, dining, and gathering. Four core materials were selected to use in these spaces: granite, concrete, wood, and cor-ten steel. Form and function is defined by the spatial variations resulting from accessible movement and gathering. Each space and entry is punctuated by a vertical shipping crate providing an exclamation point, clearly announcing the aligned entrance by color and number. Each entrance plinth provides a porous pocket for plant root establishment while resolving grade change between the street, a fixed rail line elevation, and the elevated entrances. As the Landscape Architectural consultant, we worked closely with the property owner, Jamestown, and the project architect, Elkus Manfredi Architects, to provide a design direction which offers a true streetscape presence, clarity of entry, definition of movement, and multiple opportunities of gathering to an existing and emerging innovative community. The transformation of The Innovation and Design Building has played a significant role in the development of what is one of the contemporary pioneers of the growth of the Seaport District. Continued migration of communities to this area has improved access, visibility, and viability in this once neglected district.